August: Albuquerque arachnids (all arthropods) reach an observable peak this time of year. It has been a dry summer too; so maybe they are expanding their range, seeking cockroaches and sow bugs in territories typically bereft of their predatory influence. Somebody I saw while slinging sludge said they had photos to prove that scorpions lived in Rio Rancho. They were photos of smashed up things with claws and milky white blood. Orb weavers are scattered throughout the valley's gardens. For them, a time of resigned confidence approaches; it is near the end, near the egg-laying time when their predators are preoccupied with southern visions and have also become clumsy hunters in the long hot spell. 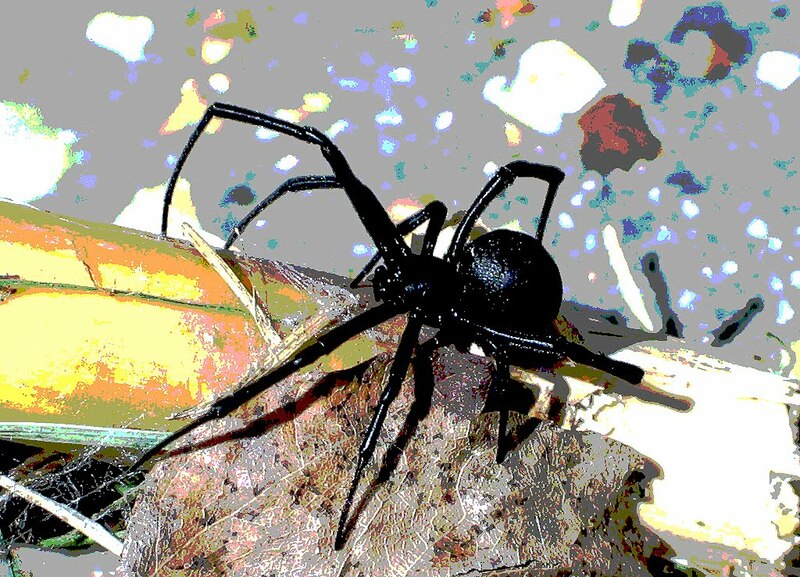 Black widow spiders are abundant, too. Some folks will tell you that the dark and spindly spiders are a dangerous animal - even as they reach a cloistered and piceous fruition this month, growing fat on stumbling flies; preparing to leave their thousand successors behind - and most will not deny that local lore, which may as well be fashioned from the summertime darkness absorbed by their stygian shells. And so here at summer's decline, a sort of hideous beauty which in observation is nearly literary as it capers cruelly on sharp and sinewy limbs upon a chaotic trap and dragging its bloody belly along for show. Its like watching the earth turn to unmeltable ice or discovering an awful, murderous race hiding in the caves beyond town. Well, it seems to me that a reading with that sort of poetic pretext practically promises some sort of bellicosity, presaging perhaps a reminder of summer's end and the triumph of a winter that will surely but is yet to come. So those spiders come to symbolize what both repulses and attracts. A signifier of thanatos hidden in shovel handles and carpet remnants and old sheds in every discretely rectangular human habitation that flows outward from the stream we call a great river. That said, I'll do battle with 'em anytime; but I am apt to leave them alone if they are somewhere outside or on the fringes of my little cubic patch of weeds and crumbly stucco world. If they seem unlikely to make contact with domestic mammals or humans then I let them be and you ought to consider that as well, because they do a damn good job on the roaches and flies. But some years, I have seen and killed many representatives of the genus of spiders called Latrodectus. Two years ago, I had to forcibly introduce a dozen of them to the tip of a steel shovel, just for being too near the house or in a place where one of the dogs liked to take a leak. This year, I've only seen two of them. One was in the corner of a disused parking lot near work. This one I stop by to say hello to, just about every day. I am learning about how it moves and reacts and so forth. It lives near to a pile of red ants, so that interaction is interesting to watch, if you have a few minutes during break time. The other was by the back door, in a crevice on the stairs that leads to my backyard. It had to go. I wasn't feeling particularly brutal that day, unless you count the folks I challenged and cajoled on Facebook, and we don't have any insecticides around the house, so I went searching for something else with which to kill the deadly black widow spider; it was just like that scene in Pulp Fiction where Butch Coolidge goes looking for something to fight the S and M rednecks with, serio. The spider was shiny and somber and starless, a perfect black satin raindrop filled with poison. The best I could do was to find a can of hair spray. The monster's ragged and corpse-laden (insects have corpses, don't they?) nest was sprayed. The spider splayed its forelegs out menacingly and retreated. Twenty minutes later, it was back. Another round of Aquanet attack and it curled up into a ball; soaked with vinyl neodecanoate, the beast began to drag itself across the sidewalk, inching towards me, lurching towards death and perhaps one final victim. I went inside and found a clear plastic cup and a pair of chopsticks. The cup I filled with about an ounce of booze. I went outside, used the chopsticks with tender and terrible accuracy to drop that tenacious adversary into a cup of icy vodka. It spread out against the bottom of the cup, vanquished but still retaining a intensely powerful form, the darkness of deep space, all legs and abdomen. I headed towards the restroom. As the whirlpool roared through the porcelain and into the abyss below the wax-ring, I vaguely hoped it did not survive all of that, and would not rise again, vengeful-like, and drunken, from the toilet, allowing summer to pass from water and light and back into ice and night.